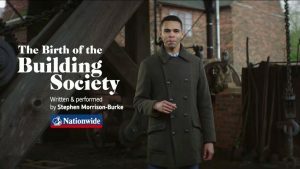 Nationwide launched the next film as part of their Voices campaign with this latest TV spot, “The Birth of the Building Society”. Telling the true story of how building societies came to be, it’s a compelling account of the very beginnings of the social movement that started in 1775. The poem shows us what happens when every day people help everyday people and is a perfect encapsulation of the Nationwide ethos. The new poem was written and performed by Stephen Morrison-Burke. Born and raised in Northfield, south Birmingham, Stephen’s talent for writing first came to public attention in 2012 when he was chosen as the city’s youngest poet laureate in its 20 year history. The film was shot on location in Birmingham and features key locations from Birmingham’s industrial history including the Black Country Living Museum and Gas Street Basin. The new film launched on Monday 2nd July, and will run alongside an OOH campaign that goes into more detail on the foundations of Nationwide. First brought to our screens by VCCP in 2016, “Voices Nationwide” is famous for letting everyday people tell their stories in their own words. This next chapter in the ongoing narrative gives a voice to those who were there at the beginning, voices from the past who are part of the founding story who helped to build Nationwide into the mutual it is today.